Display All three smartphones come with bezel-less display, but the Vivo X21 and the OnePlus 6 comes with iPhone X-like notch screen. The Vivo X21 features a 6.28-inch full HD+ AMOLED display with 1080x2280 pixels resolution while the OnePlus 6 houses a 6.28-inch FHD+ Optic AMOLED screen with 19:9 aspect ratio. OnePlus 6 enables users to enable and disable the notch as per their need, while Vivo X21 doesn't offer this feature. On the other hand, the Samsung Galaxy A8+ sports a 6-inch FHD Super AMOLED Infinity Display of 2220 x 1080p resolution. Operating system The Vivo X21 and the OnePlus 6 runs Android 8.1 Oreo operating system. As confirmed by both Vivo and OnePlus both the device will receive Android P update as well. Whereas Samsung Galaxy A8+ runs Android 7.0 Nougat operating system. Processor The Vivo X21 is powered by an octa-core Qualcomm Snapdragon 660 processor. This processor is used in many of the mid-segment smartphones. On the other hand, the OnePlus 6 is powered by Qualcomm’s flagship processor Snapdragon 845 which is found in high-end devices. The Galaxy A8+ is powered by company’s own octa-core Exynos 7885 processor. 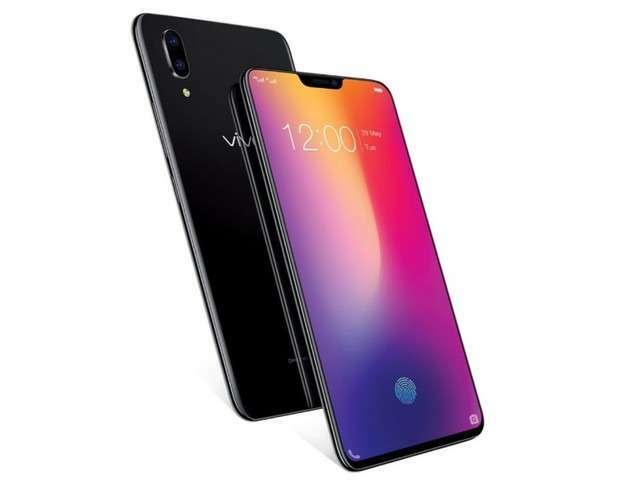 RAM and storage The Vivo X21 offers 6GB of RAM and 128GB internal storage. While the OnePlus 6 comes in two variants -- 6GB RAM and 64GB internal storage, 8GB RAM and 128GB internal storage. On the other hand, the Galaxy A8+ packs 6GB RAM and 64GB inbuilt storage. All the three handsets offer microSD card support. Camera The Vivo X21 and the OnePlus 6 feature dual rear camera setup, while the Samsung Galaxy A8+ offers dual selfie camera. The Vivo X21 consists of 12MP+5MP rear camera with LED flash. The front packs a 12MP selfie shooter, whereas 16MP primary and 20MP secondary camera with LED flash and a 16MP selfie shooter. The Galaxy A8+ has 16MP primary camera and 8MP secondary camera on the front and a 16MP shooter at the rear end. Battery The Vivo X21 houses a 3200 mAh battery with fast charging, while the OnePlus 6 packs a 3300 mAh battery with Dash charging support and the Samsung Galaxy A8+ is backed by a 3800 mAh battery. If you’re looking for a smartphone with 512GB of built-in storage, there’s only one such device to buy right now, and it’s hardly affordable. But that might change later this summer when the Galaxy Note 9 arrives. 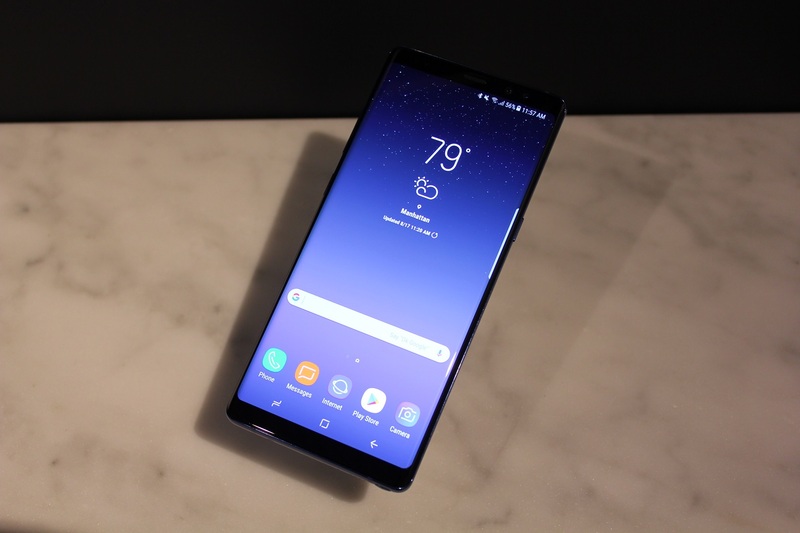 A new report says that “lucky” buyers will be able to score Galaxy Note 9 versions sporting 8GB of RAM and 512GB of storage, which would be a notable achievement for Samsung. The “lucky” part seems to suggest that only specific markets will receive this particular version, with China likely being one of them. After all, Samsung did make custom phones for China, whether we’re talking about colors or memory and storage upgrades. If the report is accurate, this Galaxy Note 9 model will have as much RAM as the OnePlus 6, which currently outperforms the Galaxy S9 in benchmark tests. As for total storage, the Galaxy Note 9 is likely to support microSD cards of up to 400GB, which means the maximum storage would be at almost 1TB for the 512GB model. The 512GB Galaxy Note 9 will be the most expensive Galaxy Note 9 option in those markets where Samsung will make it available. 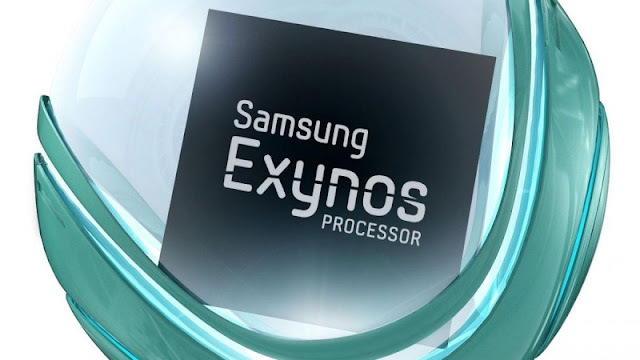 A few days ago, a recent benchmark test for the Exynos 9810 version suggested that the base Galaxy Note 9 model will have 6GB of RAM. It’s likely that the cheapest Galaxy Note 9 will have 64GB of storage. The Galaxy Note 9 is expected to be unveiled this summer, with some reports saying the phone is coming earlier than anticipated. The Galaxy Note 8 is just what we expected. That's great news. Samsung's pen-enabled, high-end flagship phone fills the shoes of the dearly departed Note 7 elegantly. It's basically a Galaxy S8+ with an S Pen and dual cameras on the back. And considering the S8 is our favorite phone of the year so far, the Note 8 looks very promising. We got a chance to spend some time with the phone ahead of Samsung's launch event and have some first impressions. The Galaxy Note 8 feels like a slightly bigger Galaxy S8+, as you'd expect. It's 2.94 inches wide, which is pretty narrow for something with a 6.3-inch screen. It's a little bit too wide for me to use one-handed, but Galaxy Notes have never traditionally been one-handed phones. The screen has the very narrow bezels of the Galaxy S8, with slight sloping on the back reminiscent of the Galaxy Note 5. The S Pen pops out of a slot at the lower right of the phone. The SIM card slot doubles as a microSD slot. 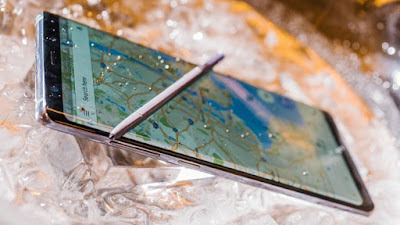 The phone is waterproof, with or without the S Pen installed. Its all-glass construction makes me worry about breakability, as much as I worry about it with the Galaxy S8; you'll probably want to get a case. It will come in black and gray in the US, and also blue and gold elsewhere. The gold is a bit garish, but the blue is gorgeous, and I wish we were getting it. The phone has both a USB-C port and a headphone jack. It's compatible with Samsung's Dex desktop dock that essentially turns the phone into a desktop PC. But it's too big to work with the current Gear VR headset if you want to do VR. Samsung has a compatible model that will be available starting September 15 for $129.99. 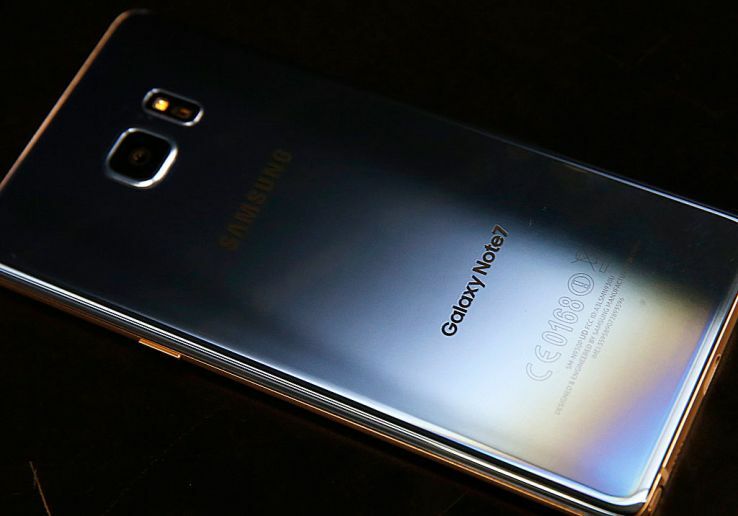 The Galaxy Note 7's biggest problem, of course, wasn't revealed in reviews. The phone's problem was that it exploded. Samsung seems to have genuinely moved on past that, though. Back in March, we took a trip to Korea to see the company's newly rigorous battery-testing procedure. According to Samsung reps, the company has further enhanced its testing by putting the Note 8's batteries through a new UL regime invented for this device. Battery conservatism might also be why the Note 8 has a smaller battery than you'd otherwise expect—a non-removable 3,300mAh cell. That's smaller than the Galaxy S8+'s 3,500mAh battery, and the S8+ is a smaller phone. The difference, Samsung pointed out, is that the Note 8 has to fit an S Pen into its narrow body. Samsung promises "all-day" battery life, but we'll have to see about that. The phone runs Android 7.1.1 on a Qualcomm Snapdragon 835 processor, and Samsung told us we should expect pretty much the exact same CPU and modem performance as on the Galaxy S8. (There is also a Samsung Exynos version, but it will not be sold in the US). In practice, the phone felt fast and smooth, just like the S8 still does after six months. There will be an Android O upgrade eventually, but Samsung isn't promising a specific date. One neat new feature in Samsung's Android skin helps take advantage of the big screen. "App pairings" are groupings of two apps that you can preset to launch together, by swiping in from the edge of the screen. Those apps will then launch in dual-window mode, one on each half of the screen. That way, you can pull up your phone dialer and your calendar with a conference call code at the same time, for instance. Other Samsung phones that support dual window and edge swiping may get this feature in the future, Samsung said. Modem-wise, the Note 8 joins the Galaxy S8 with gigabit LTE support and all the trimmings. The Note 8 can hit potential gigabit speeds on AT&T, Verizon, and T-Mobile. It only lacks T-Mobile's new Band 71 for extended rural coverage, which is coming in a potential future Samsung smartphone and, presumably, in the LG V30. The US version of the phone will have 6GB of RAM and 64GB of storage; there will be other versions with more storage in other countries. The biggest new feature here comes in the form of dual 12-megapixel cameras. Samsung decided to go for 1x and 2x telephoto, like on the Apple iPhone 7 Plus, as opposed to a different two-camera setup. Both cameras have optical image stabilization to compensate for shaky hands; the 1x camera is f/1.7 for low-light performance, and the 2x camera is f/2.4. The phone switches between the 1x and 2x modes very quickly. The camera app can also create great-looking bokeh effects, and you can even tweak the bokeh focus after the fact, creating new JPG versions of the image with different focal depth. The camera app now has a dramatic full-screen option, with a floating shutter button, that fills the screen with your viewfinder image. It looks great. And as the Galaxy S8 is currently our top camera phone, we have high expectation for the Note 8. Galaxy Note lovers come for the S Pen. If you're any kind of visual thinker, the S Pen unlocks all sorts of creativity. My daughter uses a Galaxy Note 4, and her S Note app has dozens of pages of notes, ideas, drawings, and cartoons. The Galaxy Note 8 has an S Pen with a very narrow, pressure-sensitive tip: it's 0.7mm and supports 4,096 pressure levels. 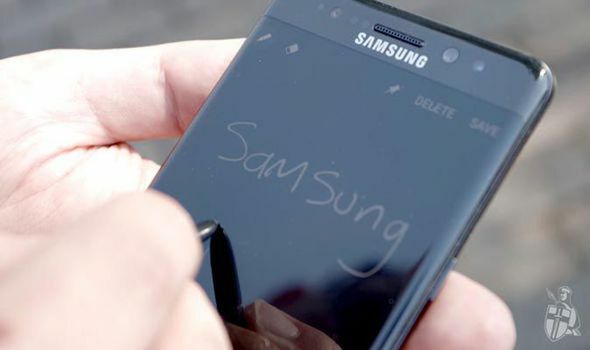 When you pull it out, you can draw on the screen even if the phone is locked, a feature Samsung calls Screen-Off Memo. Screen-Off Memos can now take up to a hundred pages; you're not restricted to one screen. Another S Pen addition, Live Messages, tries to enhance Galaxy Note messaging with fun features like the ones you find in Apple's iMessage. You can draw a handwritten note using regular, sparkling, or neon ink, and have it turned into a GIF to be sent through any messager you want, like SMS, Facebook, WhatsApp, or anything else. It's a cool feature, and I love the interoperability. But to really lead, it needs to support stickers and graphics. It's easy to get excited about the Galaxy Note 8. It takes one of the best phones of the year, the gorgeous Galaxy S8, and makes it better. Of course, we loved the Note 7, too, and then it set itself on fire, but Samsung really seems to have learned its lesson there. Samsung didn't give us a price for the Note 8, but we assume it'll be $100 more than the S8+. That makes it a very expensive phone. The two differentiators here are the S Pen and the dual cameras. If you're an S Pen lover, there's going to be a major processor, camera, and modem performance jump here over the Note 5. You're going to pay a stiff price for the Note 8, but you'll get elegant, top-of-the-line everything, plus your beloved pen. If the S Pen doesn't entice you, mull over whether the dual cameras are worth the premium. There are two big competitors looming for the Note 8, neither of which we feel like we have a good handle on yet. The Google Pixel XL 2 and the Apple iPhone 8/X/Pro/Edition could both be very good phones. We're not sure that either will include an active stylus, though, which places the Note 8 in a class of its own. The Note 8 will go on presale August 24, and on sale with all five major US carriers, plus an unlocked version compatible with all carriers, on September 15. If you buy the phone on presale, you can get either a wireless charging pad and a 128GB microSD card, or a Gear 360 camera, bundled in free. Check back for a full review ahead of the phone's release. 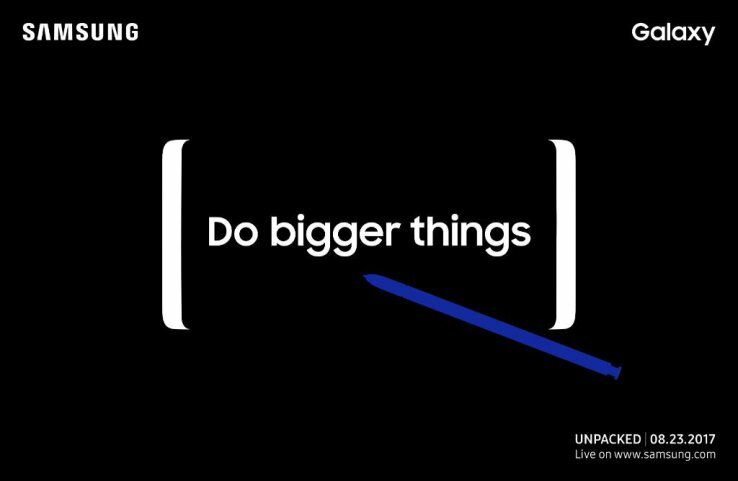 Samsung’s next Unpacked event is arriving right on schedule — and all signs point to it bringing the Galaxy Note 8 along for the ride. The big show lines up with the phablet’s traditional release schedule, and the graphic appears to show an Infinity Display version of the Note 8, along with the requisite S-Pen (don’t call it a) stylus. Unpacked is being held August 23 in New York City, a week or so ahead of the IFA tech show in Berlin, where the company released the first version of the phablet way back in 2011. While it’s far from the first big event the company has thrown since the Note 7 proved to be an unmitigated and seemingly endless disaster, the unveiling will be yet another very public trial for the company as it attempts to put those bad vibes behind it for good. There was some speculation in the wake of fallout that Samsung might abandon the Note name altogether, but prior to the exploding battery saga, the product was one of the company’s most popular global offerings. Since then, speculation has centered around what’s expected to be premium pricing for the handset — at around $900 for an unlocked version of the phone. Those same rumors also put the phone’s display at 6.3 inches — just a hair over the Galaxy S8 Plus’s 6.2-inch screen. 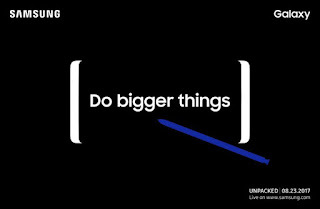 That seems to fly in the face of the “Do bigger things” slogan gracing the invites also tweeted out by Samsung social media, but it is still considerably larger than the Note 7’s 5.7-inch screen. Also, that’s still a really, really big phone, so, it’s all relative, really. The aspect ratio and design language aren’t expected to change much, which is good news. The S8 is a lovely piece of hardware that manages to cram a big screen into a surprisingly small footprint. Other pretty reasonable rumors include the Snapdragon 835 processor the company was reportedly hogging for inclusion on the S8 and a 3,300 mAh battery — that’s a downgrade from the Note 7 and the S8 Plus, both of which sported a 3,500 version. Though, given what happened last time around, it’s hard to blame the company for being overly cautious, I suppose. An Infinity Display and Bixby (which, as of this week, finally includes voice commands) seem like pretty safe bets, too. After all, the company loves consistency across the Galaxy line. Though, with just a 0.1-inch difference in screen size, Samsung may have a tough time differentiating the perennial favorite device from the new Plus addition to the Galaxy line — beyond the inclusion of the S-Pen, of course. Hopefully the company’s still has some tricks up its sleeve, while managing to not fly too close to the sun this time around. Whatever the case may be, we’ll be on-hand at the NYC event, watching it unfold live. 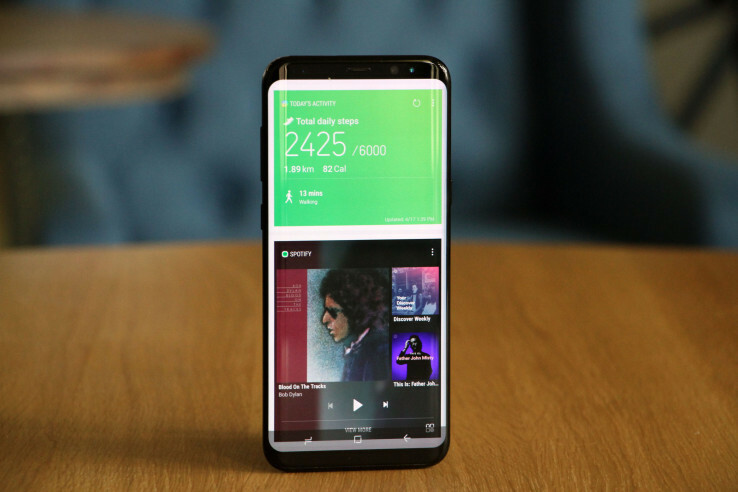 After much delay, Samsung has begun rolling out it Bixby smart assistant to users in the U.S.. The company said today that an update will allow owners of the Galaxy S8 and S8+ to gain voice capabilities for the service. Now, however, those luckily users in the U.S. will be able to navigate their device, make calls, set tasks and more using their voice thanks to Bixby. Bixby is the Korean phone-maker’s take on Apple’s Siri, Google Assistant and Amazon Alexa, but it didn’t ship with Samsung’s Galaxy S8 and S8+ when the phones launched in March. Instead, the firm shipped a limited ‘preview’ of the service in June. “Almost anything you could do with touch or typing, you can now do with your voice,” Samsung said of the new capabilities for Bixby, adding that third-party support will come next. There’s a lot hanging on that. Samsung went to the trouble of adding a dedicated Bixby button to the S8 phones, and how it is embraced by makers of other apps and owners of other services will be the key if it is to graduate from voice assistant to intelligent assistant as rival services are doing. For now though, we’ll have to wait. There’s not even word on when Bixby will expand its language support beyond English — which is also open to users in Samsung’s native Korea, but Korean isn’t. More language options is a key move to globalize the service, and give other ventures — Samsung is reported to be looking into a Bixby-powered speaker — the potential to take-off. Today’s update is very much the first step of a long journey. Samsung Electronics announced today that it will recycle parts from Galaxy Note 7 smartphones, which gained notoriety last year after a battery defect caused several to burst into flame. The company said in a statement on its Korean site (via Google Translate) that it also expects to recover 157 tonnes of rare metals, including gold, from the devices. In its new announcement, Samsung said it will recover components like OLED display modules, memory chips, and camera modules from Galaxy Note 7s and reuse them for repairs or recycle them. Rare metals, including cobalt, copper, and gold, will be recovered during the recycling process. Sales of the Galaxy Note 7 were suspended last September, but Samsung confirmed in March that it plans to sell refurbished Galaxy Note 7s instead of throwing them away. Samsung's Galaxy Note 8 looks set to be unveiled in just a few months time with rumours suggesting an August or September launch. This new device is likely to include a giant 6.2-inch edge-to-edge display, dual-lens camera and fully refreshed S Pen which will now vibrate as it touches the display. We are also expecting the Note 8 to include a giant battery and Qualcomm's latest and greatest Snapdragon 835 processor. If the rumours are true, the Galaxy Note 8 could be the best smartphone of 2017, however, there may be a problem with this next-gen phablet. A new leaked image from OnLeaks claims to show a real-life render of the Note 8 which clearly shows a rear-mounted fingerprint scanner. To make matters worse it appears Samsung has followed its current Galaxy S8 by placing it right next to the camera. Samsung's S8 flagship has been criticised for its irritating placement of this highly important sensor and it seems the Note 8 could be heading the same way. The reason many have slammed the S8's design is due to the fact users often end up covering the lens in mucky fingerprints as they reach to find the scanner. Samsung even appears aware of this issue with a regular reminder popping up on the display suggesting users make sure they clean the lens before taking images. There's no confirmation if the Onleaks image is correct but it does match up with another render that's recently been posted online. Along with Onleaks, tech website BGR has also produced an exclusive render based on schematics that they say came directly from the factory tasked with building the new phone. This image also reveals a dual-lens camera with the scanner placed alongside the lens. Many experts had thought that Samsung had finally cracked the technology to place the scanner under the display but, if these renders are correct, it appears that isn't the case.